Two men who meet in a psychiatric institution couldn’t possibly find happiness together—could they? The world seemed to be telling disgraced former child star and singer Cameron Fox that he would never be happy again. A drunken car accident gets him sentenced to a work release program at Riverbend Behavioral Health Facility. Reclusive, traumatized writer Jonah Radley has an entire graveyard of skeletons in his closet. Jonah regularly hospitalizes himself for psychotic episodes caused by a horrific childhood trauma, his biggest secret—one he refuses to speak about in therapy. 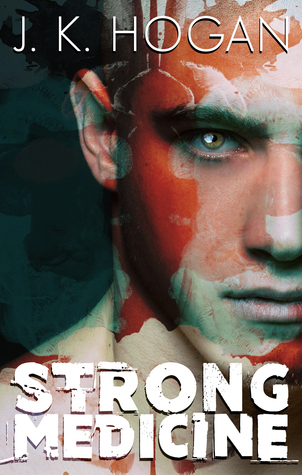 Jonah and Cameron form a bond inside the hospital, forged in mutual pain and hope for a better life. Once they leave the hospital, they must decide if they are brave enough to explore the intricacies of living with mental illness—and find a new normal together. This was some really tough reading. Be aware, a lot of the dreadful stuff is on the page, and you may find your gorge rising as I did. This book is part horror, part love story, and expect to be unsettled because of it. There are monsters in Jonah’s life. Damaged and nearly broken from his traumatic childhood, he’s haunted by the figures who will not stay quiet in the grave. When they grow too insistent to ignore, Jonah checks himself into Riverbend. Cameron’s at Riverbend as something of staff, something of inpatient, while he’s sorting out the reasons for his self-destructive behavior. A prisoner of his past as much as Jonah, he needs to find what his new, self-directed future ought to hold. Both of these men are wildly unstable in their own ways, but are drawn together, and somehow each finds a strength in the other to move on, to change. The theme was wonderful. I had a little more trouble with the execution. Because of Cam’s semi-staff status, it’s inappropriate for him to become entangled with a patient, even one as unconventional as Jonah, who needs a safe haven but isn’t actively trying to participate in therapy. Both of them see formal therapy as horrible intrusions, and believe they get more insight and genuine help from the other. Jonah comes and goes like a wraith, and Cameron can’t jeopardize his borderline inpatient status, so the burn is very slow. When they finally can be together and they do add their strengths together, it’s satisfying but also flies in the face of logic. Because, really now, much that happened to Jonah is a matter of public record. It’s in the newspapers, it’s in the court documents, and for the shrinks at Riverbend to not know what happened to him is ingenuous at best. He’s front and center of the local horror story, and one needs only to go to the local grocery store to hear the whispers. How about check the medical hospital records for the source of the obvious scars or for previous organic trauma? I was also appalled at Jonah’s mother’s unwillingness to do anything at all after what happened. I think the cultural influences were dragged in expressly to explain her inaction, but she deserved some posthumous punches for her game of let’s pretend everything is fine. How could it be? I’m actually getting adrenaline surges for how angry I am with her, and she’s a character in a book, dead before we encounter her, victim of handwaving at approximately age 40, which reads like 85. A couple of other aspects require handwaving as well, such as Jonah’s illustrious career in publishing at age twenty-three, with next to no normal experience of anything he wrote about, and inability to function about half the time. I will give the author kudos for her way of sucking the reader into Jonah's mental disturbances. It's very vivid on the page. Family is Cameron’s problem too, though soul-killing in a different direction. I particularly appreciated Jonah’s comment to the controlling father at the end of the story, and hope the jerk lost lots of sleep over it. But I didn’t appreciate the way Cameron basically trashed his own skill set in sorting out his future. Not wanting to perform is understandable, discarding lucrative other options is not. Jacob Flores has gone Undercover!